Who says flower-centered birthday cards have to be boring?! 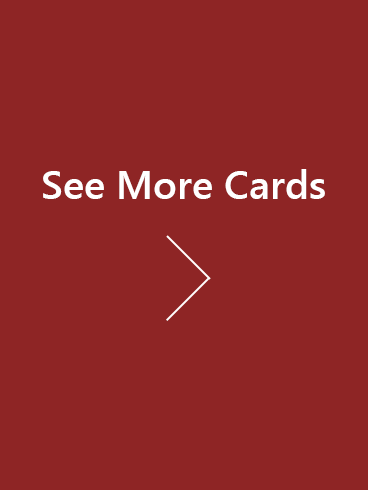 This card is a one-of-a-kind way of wishing someone special to you a very happy birthday. The mint color of the vase and light pink color of the flower create a nice contrast, while the plain background adds a nice element of simplicity. The sweet sentiment of the words is the icing on the cake of this magnificent birthday card! 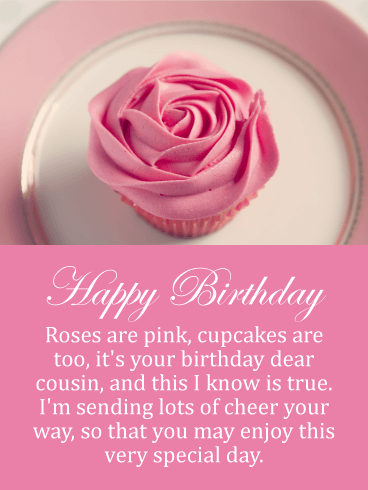 For that pink-loving friend in your life, this is the birthday card you've been looking for. 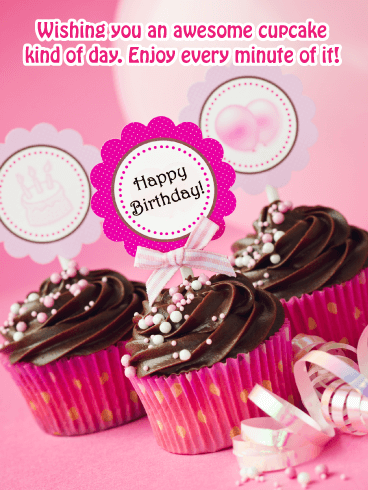 A pink background with pink balloons is sure to make their birthday extra special. A bonus is the sweet message. After all, who wouldn't want to be wished an amazing, incredible, and totally fantastic birthday?! We know we would! 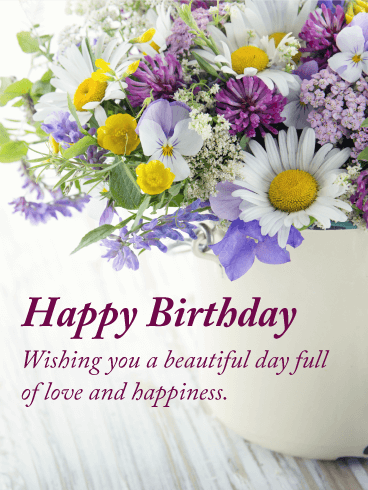 The infinite diverse pallet of color and shape found in natures bountiful beautiful collection of flowers, make for a joyous means of wishing the people that matter most to you, the best possible cheer on their birthday. Be they delightful daisies, magnificent mums, or any wonderful wildflower, the recipient is sure to feel Full of Love and Happiness. 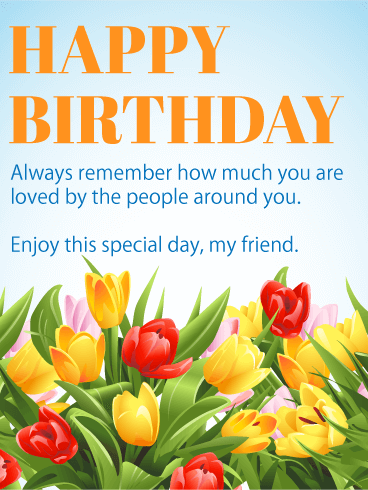 Make their day by sending them this birthday bouquet card! 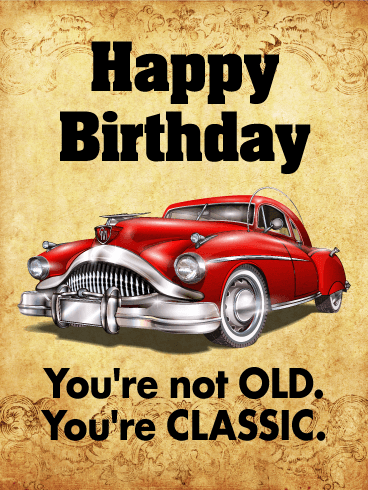 This birthday card is amazing not just for its stunning car picture on the front, but for a great pun that's bound to make anyone chuckle. It's perfect for car lovers-especially those who like antique cars-but can be a great pick for anyone who appreciates a good joke. The background has a pattern that fits right into the classic theme, and it really ties the birthday card together. This is a celebration in a birthday card! Colorful fireworks of blue, silver, gold, and red bursting across the night sky are so exciting that you'll instantly feel joy. Happy Birthday is displayed a festive script, bound to brighten any birthday. If you want a birthday card that will brighten his birthday in every way, this birthday card is the perfect choice. A bundle of birthday balloons floating through the sky are festive enough for a party. They bring a message of birthday greetings for him as you wish him all the best for the coming year. 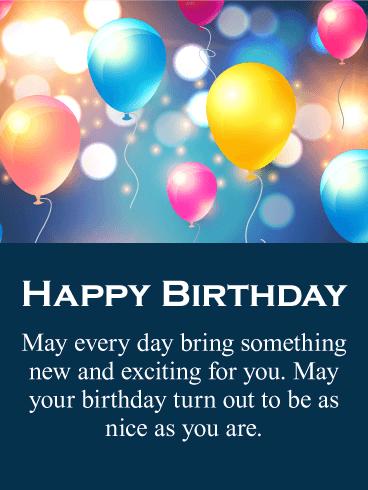 Your message in this birthday card wishes him a birthday as nice as he is and every new day to bring something exciting and new. Birthdays are the perfect time to tell your friends how much they mean to you. As their birthdays arrive, use this cheery card to say "Happy Birthday" and tell your friends how much you love them. As they read your sweet words and feel your love, they will have an amazing, joyful birthday. 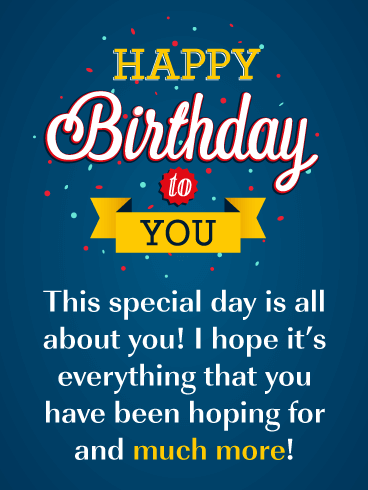 Send this Happy Birthday card to your friend today! Birthday blessings, birthday wishes. 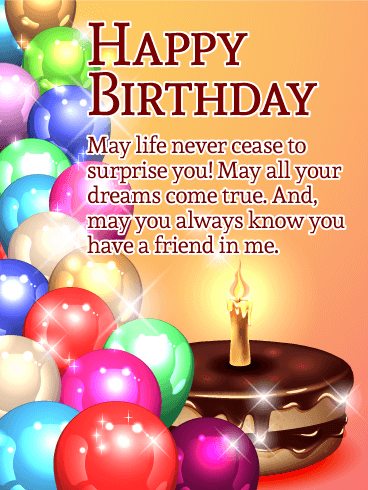 Tell your friend, on their birthday, that you hope life continues to surprise and delight them. Your friend's birthday is a great occasion to let them know that you will always be there for them, no matter what. 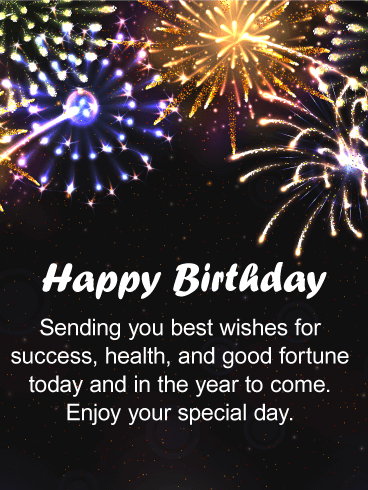 This sparkly birthday greeting card shines with love and festivity. 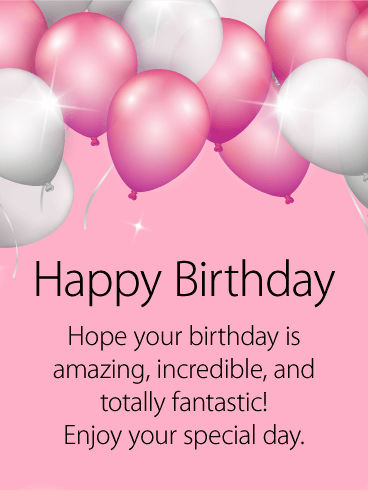 It's quick and easy to send a heartfelt message and special birthday wish to your friend with our gorgeous birthday cards. 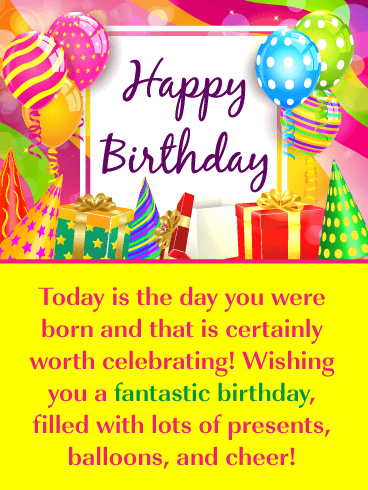 Bring some warm wishes to your friend’s birthday with this fun and colorful card! A charming white wood background is filled with lots of festive touches, like balloons, streamers and star confetti. 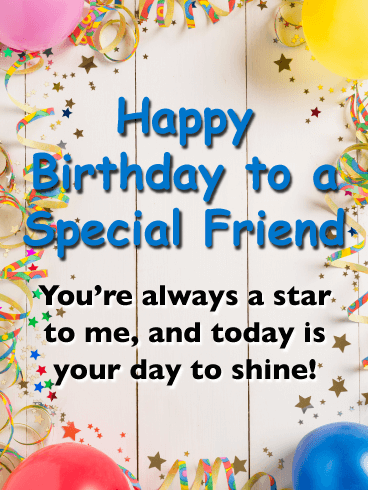 It’s all there to remind them that they’re a star in your eyes and today is their day to shine as they celebrate turning another year being someone very special to you. It’s your niece’s birthday so it’s time to show her just how exciting this day really can be! This festive birthday card showcases fantastic party hats, colorful balloons, and confetti - everything your niece would need to celebrate in style! 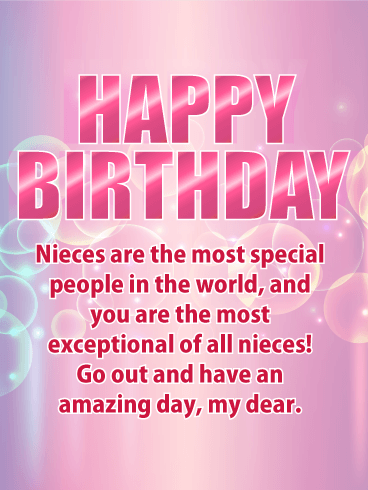 This cheerful birthday card will also wish your niece a perfect day, and let her know that you are thinking of her today. Send these party hats to your niece without delay so she can use them on her special day! A little birdie told us your niece would love getting this card on her birthday! 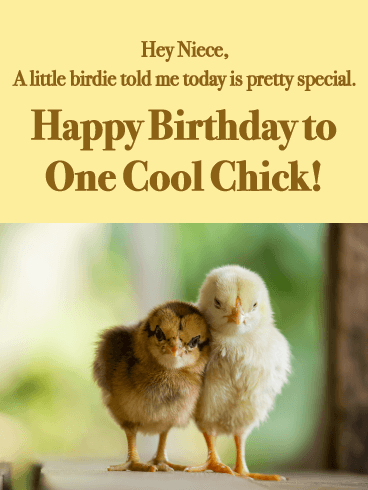 This funny greeting is the perfect choice for wishing one cool chick a celebration filled with fun, laughter and plenty of good times with family & friends. When you think of amazing people, your niece always comes to mind. Sweet, compassionate, honest. She's an exceptional woman and deserves an exceptional birthday. So send her a card full of love and praise. Let her know how much she stands out, how marvelous she is. And let her know how much she means to you. 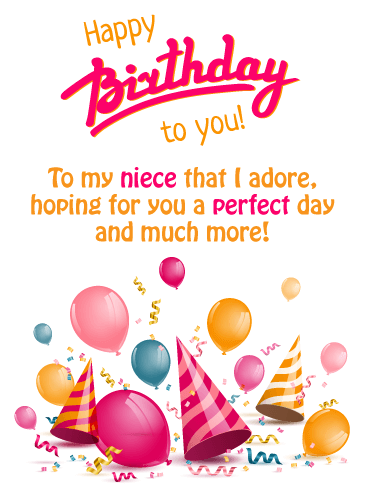 Say "Happy Birthday" to your niece the best way possible with this birthday card! What better image than a blooming daisy to help your beautiful daughter celebrate another year of life. 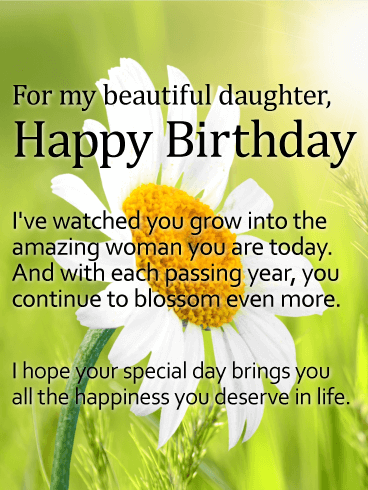 This lovely birthday card brings with it a special message for her: that she has grown into the amazing woman who continues to make you proud each and every day. This exquisite birthday card will surely impress your daughter on her very special day. 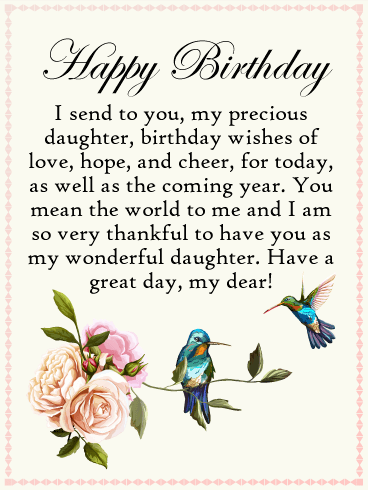 The beautiful birds and flowers, along with the lovely Happy Birthday lettering make for a wonderful greeting card that your daughter will appreciate. She will love that her mother or father is expressing that she means the world to them. Make sure to send this great birthday card out soon to get your daughter's birthday off to a memorable start! 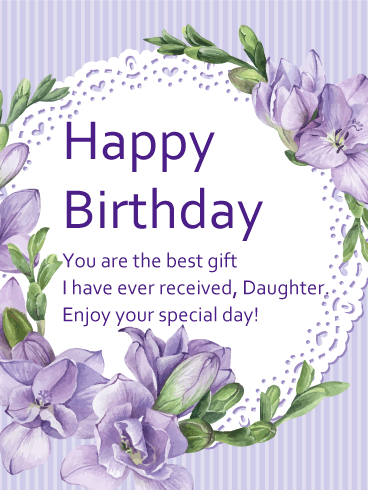 This lovely purple birthday card, with delicate stripes and flourishes of flowers, creates a sweet and feminine background, perfect for sending your special daughter on her birthday. The message is short, but incredibly powerful: "You are the best gift I have ever received." No matter how old she is, these are meaningful words that she'll cherish forever, especially knowing they came from you. What is more perfect then sending flowers to your cousin for their birthday? Sending a flower cupcake Birthday card! This beautiful pink cupcake features a spectacular rose petal frosting that your cousin will love. 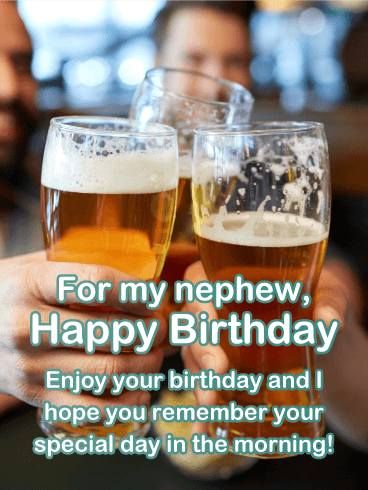 It's so unique that your cousin will appreciate that you took the time to find such a special birthday card just for them. 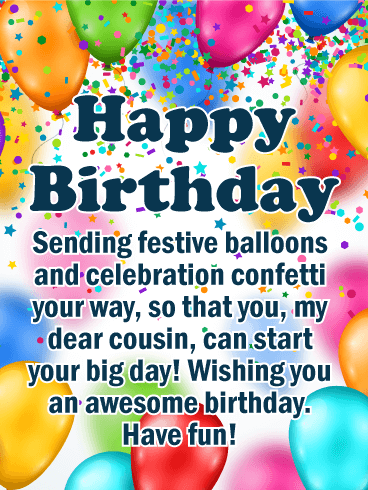 Send this birthday card your cousin's way to wish them lots of cheer for their special day. 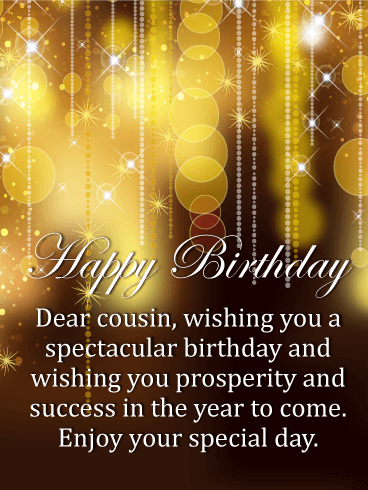 If your cousin prefers only the finest on their special day, then send this exquisite golden sparkles birthday card to him or her, it will exceed their expectations! The gorgeous backdrop features shining golden sparkles that will surely impress your cousin. Along with this, the message wishes your cousin a year of prosperity and success. So thoughtful! Your cousin will be very happy when she receives this wonderful birthday card. 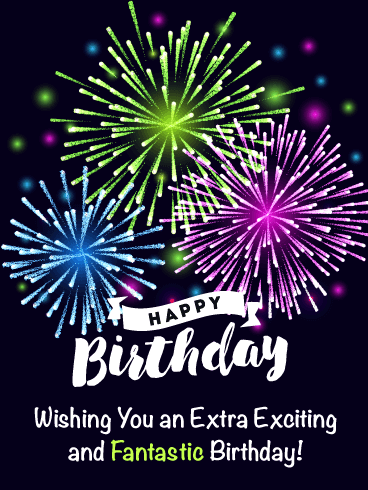 If you are looking for a greeting card that represents an exciting time, then this birthday card is your best bet! It's bursting with so much color and excitement that it will certainly get the celebration started the minute your cousin sees it. Send these birthday balloons and confetti over to your cousin to celebrate the day they were born! It's the most important day of the year, so only the best birthday card will do! Magical butterflies and glittering sparkles set the stage for this enchanting happy birthday card! 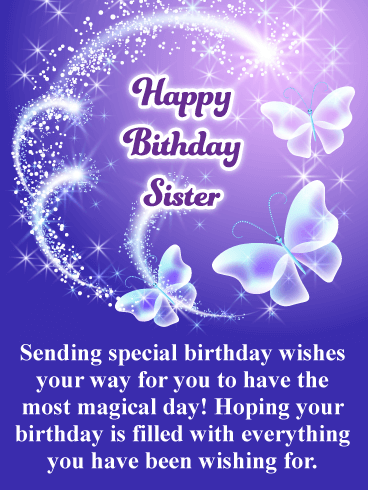 Your sister will be so excited to receive such a beautiful greeting card from you, her thoughtful sister. It will remind her of how special birthdays are and add some sparkle to her day. Fly these fantastic butterflies over to your sister to let them wish her a happy birthday on this memorable day that only arrives once a year! 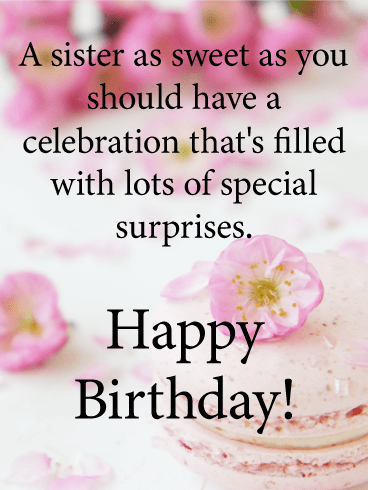 For a sweet sister, this birthday card is a wonderful way to say, "Happy Birthday!" A delightful spread of delicate flowers and delicious macarons creates the perfect setting for a celebration that's filled with many special surprises. And your thoughtful words below will have her tickled pink on her big day, knowing you took the time to remember her. 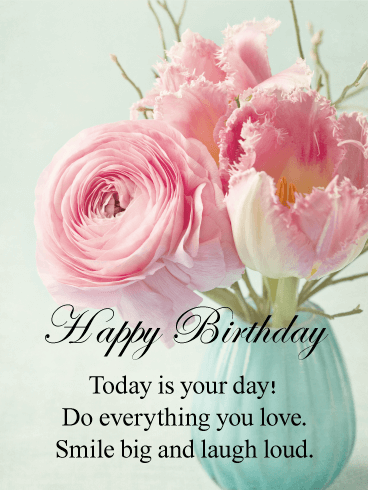 Set against a pretty pink background with delicate white butterflies, this birthday card for a special sister will bring a smile to her face while touching her heart with its sweet message. 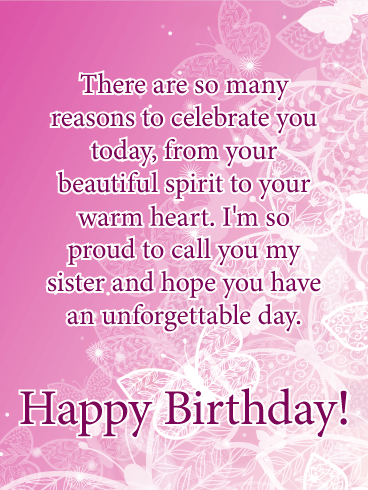 It lets her know that you have so many reasons to celebrate her and how proud you are to call her your sister. It's also a chance to wish her an unforgettable celebration, no matter how near or far away you may be. 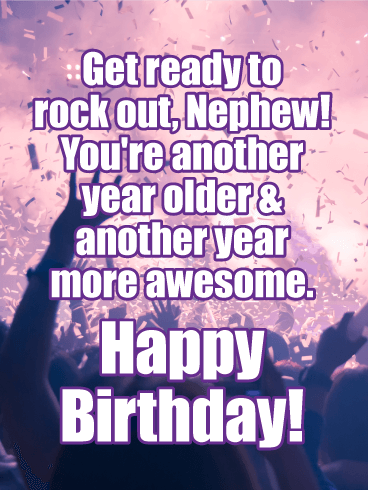 There's no doubt about it: you want your nephew to have a birthday that totally rocks. And this is just the birthday card to make sure it does! A crowd of thousands is in attendance, cheering loudly while confetti comes down, setting the scene for making him feel like the star he is, and letting him know that not only he is he another year older, but he's also another year awesome! For years, you've been the "cool aunt". Don't lose that reputation now, on the birthday that your nephew hits the last legal milestones of being an adult! You've been by your nephew's side all his life, but now your relationship is shifting. This birthday marks the start of a new chapter in his life, one where you are on equal footing. Welcome him to the last step of adulthood with open arms and wish him all the best from here on out! 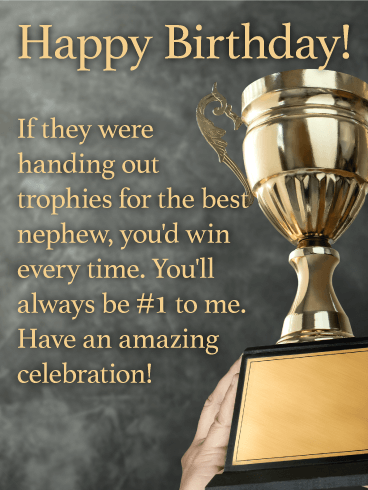 He's your #1 nephew, so on his birthday, make him feel like the champion he is with this winning birthday card! A gold trophy is held up in the air, letting him know he deserves to be celebrated like the amazing person he is, and that the happiness he feels today should last all year long!